Dress them or dress them down, not only are daybeds unique, they are also extremely versatile. Since they can be used for seating during the day and sleeping during the night, they can add functionality to a second bedroom, a guest room, a family room. Daybeds are also ideal for multipurpose rooms like a room that is used as a home office, a place to watch TV and somewhere for unexpected guests to sleep. Because of their distinctive yet charming appearance, daybeds can also be used as the focal point when decorating a room. Since daybeds come in many different styles, they are an ideal way to decorate a guest room or a child’s room or breathe new life into a sun room or porch that needs a little pick-me-up. Decide who will be using the room, either occasionally or in the case a child, on a permanent basis. Since daybeds come in a wide variety of styles, materials and colors, any theme or design you dream of can become a reality. Have fun. Gone are the days where the daybed is relegated to a young girl’s room – today the daybed is an increasingly popular choice for adding sleeping capacity to a home without compromising your design style. A daybed, with the right design and matching bed linens can be just as suitable for a boy’s space. Give a second bedroom to be used by adults a British West Indies plantation sophistication with a richly finished dark wood day bed. The possibilities are endless. Here are some simple design ideas to get you started. 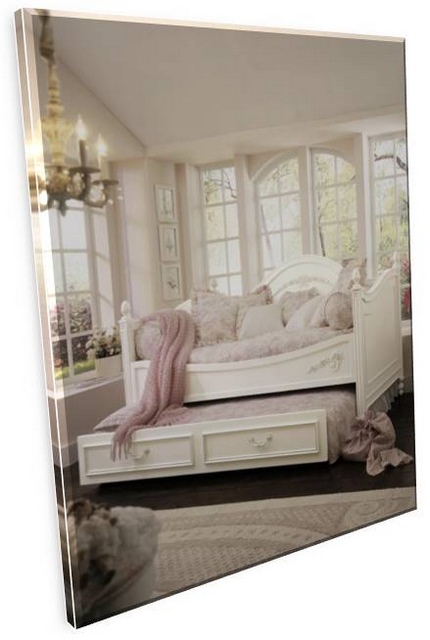 Great for princess themed rooms, Victorian daybeds are ideal for adult spaces as well. To recreate the romantic side of the Victorian era, look for a daybed that has carved floral with a pineapple or floral motif, bun feet and pilasters. The profile of the daybed back should be curved or arched. Finishes can range from white painted to wood stained, but for that heirloom look with a softly romantic touch any finish you choose should be distressed or made to look worn. The Victorian era was also know for its ironwork, both indoor and outdoor furniture, but especially beds. For a child’s room, a metal daybed with elaborate scrollwork and an antiqued finish would serve them well into their teen years. To dress the daybed in a romantic Victorian manner, select daybed linens in berry and jewel tones. For contrast include softer colors like black, navy, ivory, pale yellow and burgundy. 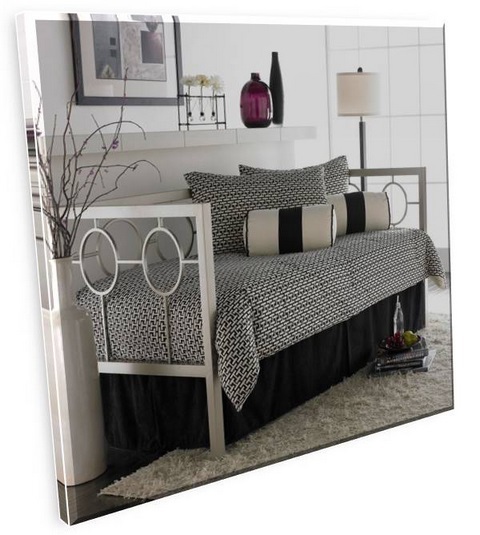 Perfect for a guest room or a teen’s room, a nautical or beach theme creates the feeling you on a seaside holiday. It’s relaxed; it’s laid-back; it’s casual. 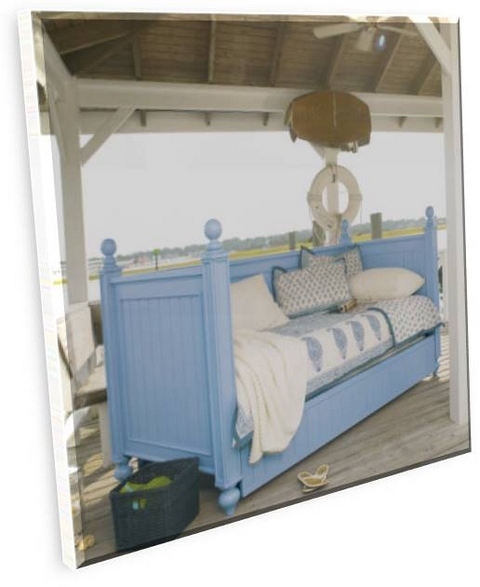 For the coastal look, you will need a daybed that reflects the color of water, sand or sky. It should also include decorative accents like louvered panels, framed sides or panels made from organic materials like bamboo or rattan. Choose a daybed bedding set that brings ocean into your décor. Nautical stripes and other ship-related topics like anchors and stars are an excellent way to make up your coastal daybed. Accent pillows or comforters with marine motifs such as shells, starfish and coastal birds are also good choices. For an English Country look that will give your room a relaxed, Old World charm, select a wood daybed with framed panels that resemble a garden fence or gate and pilasters and round oversized finials that could be mistaken for fence posts. White, oak, cherry or maple, the finish should definitely be distressed. The emphasis is on combining the warmth of the hearth with appreciation for nature. Wild roses are a common motif. 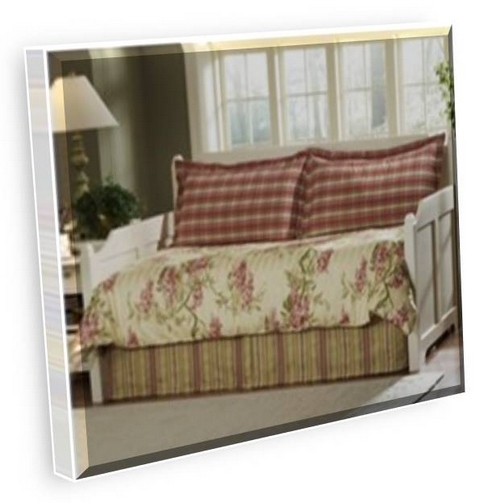 Bedding for your English Country daybed should be a riotous mix of patterns. Don’t be shy; plaids and stripes will happily mix with floral patterns in pastel or bold colors. For a contemporary look with a touch of space age design, the daybed you select to create an ultra modern room will most certainly be constructed of metal, preferably with a steel or nickel brushed high gloss or matte finish. Lines are clean and spare for streamlined appearance. For an ultra modern style with a little retro sophistication, choose a daybed with geometric accents. The daybed linens for your ultra modern cool daybed will be either black and white or bold colors with geometric or asymmetrical patterns. To add a little retro to your ultra modern cool design, choose a daybed comforter set with an interlocking circle pattern in different shades of gray.